The cell-based assay has become a mainstay of drug development, addressing new concerns raised by the advent of biologics. These concerns include the difficulties inherent in characterizing drug efficacy and patient safety in the context of immunogenicity. Whereas small molecule drugs may escape detection by the immune system, larger protein therapeutics, such as monoclonal antibodies, are apt to trigger alarms. The formation of anti-drug antibodies (ADAs) can elicit allergic responses in some patients; but a less obvious consequence, the loss or “neutralization” of drug activity, can occur if an ADA interferes with drug function. The increasing popularity of biologics has made immunogenicity assays a critical component for delivering safe and efficacious products to the market, but the development and implementation of these assays present new technical challenges. These challenges were discussed at the Eighth Annual Immunogenicity BioAssay Summit, which took place recently in Baltimore. The event provided a forum for discussing bioassay development issues. For example, it highlighted strategies for detecting NAbs and facilitating lot release. 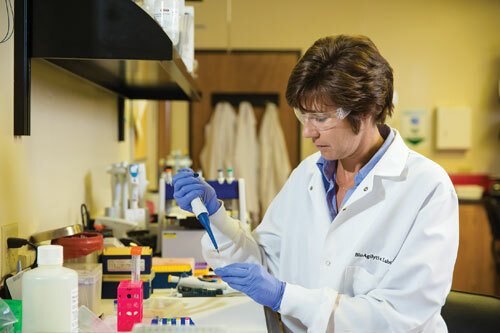 Regulatory agencies generally prefer cell-based assays. When these assays are designed appropriately, they mimic the drug’s mechanism of action in vitro. However, contention around the use of cell-based functional assays versus non-cell-based competitive ligand binding assays for NAb detection exists within the field. One presentation at the summit that illustrated this “turning of tides” directly compared a ligand binding assay against a cell-based platform for the detection of in vitro NAb against benralizumab. Benralizumab, a monoclonal antibody used to treat severe, uncontrolled asthma, depletes eosinophils through a mechanism of action called antibody-dependent cell-mediated cytotoxicity (ADCC), where drug binding to interleukin 5 receptor alpha (IL-5Rα) instructs effector cells of the immune system to remove eosinophils through apoptosis. Yuling Wu, Ph.D., a principal scientist at MedImmune, validated both a ligand binding assay and a cell-based assay used to determine if ADAs collected from the serum of patients on benralizumab neutralized drug activity in vitro. The ligand binding assay evaluated the ability of the ADAs to prevent the labeled drug from binding to soluble recombinant IL-5Rα, while the cell-based assay used a cell line stably transfected with IL-5Rα as target cells and a reporter cell line as effector cells. Dr. Wu concluded that the “data demonstrated that the ligand binding assay was more sensitive, drug tolerant, and robust than the cell-based assay,” and MedImmune decided to move forward with the ligand binding NAb assay for their Phase III trials of benralizumab. Dr. Prasad illustrated these stages with a relevant example: bevacizumab, which is a monoclonal antibody that impedes tumor angiogenesis by inhibiting activation of the vascular endothelial growth factor (VEGFR-2) receptor. The growth factor VEGF-A, he explained, binds to the receptor (binding event), activating VEGFR-2 and causing dimerization (molecular event), which initiates blood vessel growth and angiogenesis (phenotypic event). DiscoverX optimized its functional cell-based assays by focusing on the molecular event, or, in the case of their PathHunter® bevacizumab bioassay, VEGFR-2 receptor dimerization. The bioassay uses the company’s enzyme-fragment complementation technology, which results in a chemiluminescent signal when two enzyme fragments, a donor-acceptor pair, come together. Thus, functional activation of VEGFR-2 receptors tagged with the enzyme fragments will emit a signal upon dimerization. However, if bevacizumab, or a biosimilar, blocks VEGF-A binding, it inhibits dimerization and the resulting chemiluminescent signal. DiscoverX has complemented the simplicity of its chemiluminescent readout with the adoption of cryopreserved, ready-to-use cells—a growing trend in the industry. In addition to decreasing cell-culture variability, the use of cryopreserved cells has facilitated the conversion of DiscoverX’ bioassays to a ready-to-use format. Their kit-based approach allows clients to “focus on what’s most important for them, which is running the assay,” noted Abhishek Saharia, Ph.D., director, cell-based assays and biologics, DiscoverX. This protocol comparison highlights how bioassays from DiscoverX can obtain rapid results. (A) The PathHunter Bevacizumab Bioassay uses cryopreserved ready-to-use cells that do not require any cell culture. The entire assay can be completed in less than 24 hours with a simple add-and-read protocol. (B) The HUVEC proliferation assay requires that cells be cultured one to two weeks before they can be used in a proliferation assay that takes an additional three to four days. Expiring patents for biologic drugs are ushering in the first generation of biosimilars. At the same time, a new generation of innovative therapies with complex, multistep mechanisms is peeking over the horizon. For example, antibody drug conjugates (ADCs)—targeted therapies comprised of an antibody, a linker, and a toxin—rely on cell binding, internalization, and cytotoxicity steps for their therapeutic effect. “If we think of the ADC as a guided missile, the antibody acts as the targeting system and the toxin as the warhead” illustrated Shan Chung, Ph.D., senior scientist, bioanalytical sciences, Genentech. Although Dr. Chung emphasized that ADCs have tremendous clinical potential, he also allowed that only a few ADCs, including Genentech’s Kadcyla for Her2-positive metastatic breast cancer, has made it to market compared to the much larger number of monoclonal antibodies. He attributed the discrepancy to the additional technical challenges ADC developers face, including immunogenicity testing. Dr. Chung asserted that the most formidable challenge in NAb assay development is acquiring and characterizing antibodies that can serve as a positive control for assay verification. Generally not available off the shelf, control antibodies are produced by immunizing an animal with the drug, collecting and purifying the ADAs generated, and confirming their ability to neutralize drug activity. ADCs further complicate the acquisition process, because the control antibody needs to react to all three components of the ADC. “ADCs constitute one of the more difficult biologic classes when it comes to developing NAb assays, and the primary reason for this is that you have both a small molecule moiety and also the antibody,” elaborated Dr. Chung. “When a small molecule (toxin) is conjugated to a large molecule, like a protein, then that toxin itself can be immunogenic.” Furthermore, the assay should demonstrate which step in a multistep mechanism of action the antibody exerts its neutralizing effect. Dr. Chung cited drug interference as the second most significant challenge in NAb assay development. “Patients receive high doses of the drug, so these samples contain not only ADAs, but also a high drug concentration that can interfere with the assay,” he explained. Referred to as the “drug tolerance” of the assay, the ability to obtain reliable results from drug-containing samples is a common theme for NAb studies, and different methods to remove excess drug and purify patient ADAs, including acid dissociation and affinity extraction, have emerged as possible solutions. Immuno-oncology has become a very active area of drug development for many biopharmaceutical companies, and a prominent therapeutic strategy is combination immunotherapy. “Our customers are looking at the exhausted T-cell phenotype and understanding that there may be multiple inhibitory receptors present, and if you target multiple receptors, such as PD-1 and CTLA-4, you see a much more pronounced effect,” commented Richard Somberg, Ph.D., strategic collaborations manager, Promega. Promega’s PD-1/PD-L1 Blockade Bioassay consists of two genetically engineered cell lines: PD-1 effector cells and PD-L1 aAPC/CHO-K1 cells. When the cells are co-cultured, the PD-1/PD-L1 interaction inhibits the luminescence that is mediated by T-cell receptors (TCRs). When the PD-1/PD-L1 interaction is disrupted, TCR activation induces luminescence via activation of the nuclear factor of activated T-cell (NFAT) pathway. After addition of Bio-Glo Reagent, luminescence may be quantitated with a luminometer. Promega has developed portfolios featuring functional cell-based assays for both co-inhibitory and co-stimulatory immune checkpoint targets. To assess the response of co-inhibitory receptors, Promega has developed a dual-cell platform that represents the immune system with a Jurkat human T-cell line and an antigen-expressing cell with an easy-to-culture cell line—typically CHO cells. The platform mimics a drug’s mechanism of action in a simple system that lets researchers interrogate activation pathways using a luciferase reporter construct. For example, Promega has modeled the interaction between PD-1 (programmed cell death protein 1) and PD-L1 (programmed cell death ligand 1). The result is the company’s PD-1/PD-L1 Blockade Bioassay. It contains a co-culture of genetically engineered Jurkat and CHO cell lines expressing PD-1 and PD-L1, respectively. When PD-1 engages PD-L1, activating a mechanism used by tumors to evade the immune system, it blocks the activity of a T-cell receptor that induces luminescence. 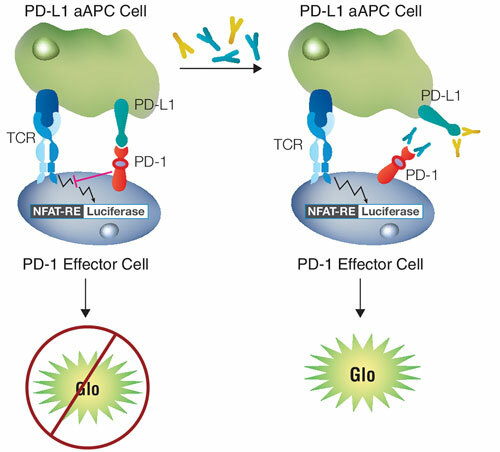 However, adding an immunotherapy that disrupts the PD-1/PD-L1 interaction to the assay re-establishes T-cell receptor activity and generates a measurable luminescence signal that allows assessment of drug effectiveness and potency. “The main challenge in building a reporter gene bioassay is identifying the most biologically relevant cell background and signaling pathway to accurately model a drug’s potency and mechanism of action,” stated Dr. Somberg. Designing a cell-based assay requires a solid understanding of the underlying drug mechanism of action, and the variety of methods used to simplify and model these mechanisms are as varied as the mechanisms themselves. The Immunogenicity BioAssay Summit provided a lens into the vast array of assays that can help ensure the safety and efficacy of new drugs.